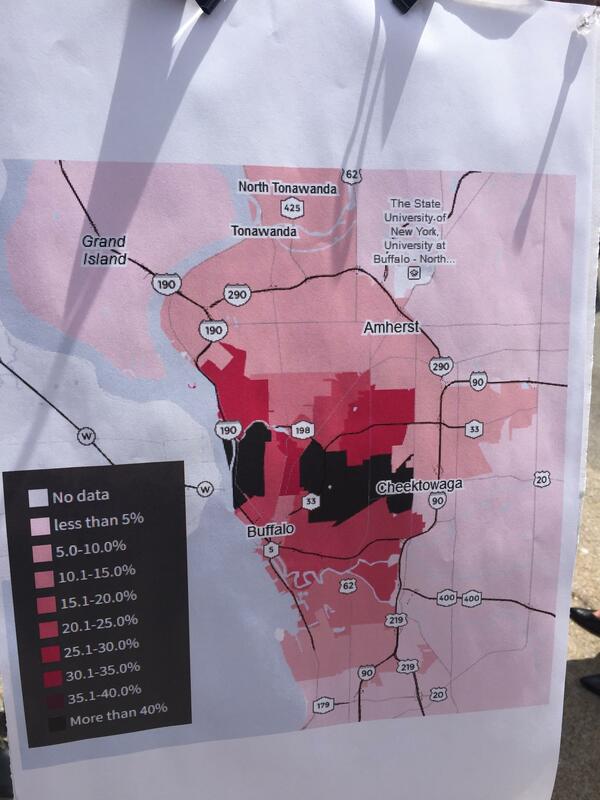 Areas of Buffalo with children testing positive for lead. There are three zip codes in the city of Buffalo that have children testing positive for lead in their bloodstream at high rates. Over 40 percent in some, with areas like the Buffalo-Cheektowaga border raising large concern for public officials like Assemblyman Sean Ryan. “There’s no safe level of lead in your bloodstream. To see areas where we have 40 percent tests, that’s a public health crisis and it’s highly disturbing. Lead poisoning is a silent epidemic,” said Ryan. New York currently sets the actionable level of lead in your blood at 10 micrograms per deciliter. Ryan said the state is lagging on this issue. The good news is that great progress has been made in the past when government has taken action, said Partnership for the Public Good Executive Director Sam Magavern. In 2017, 466 children in Erie County tested with levels between 5 and 9 micrograms. Magavern said lead poisoning rises in the summer because the paint on the exterior will get trekked into the house. Many cases come from lead dust. Kids just playing in a home where there is deteriorated paint may lead to low-level poisoning. “Each year, Partnership for the Public Good’s 275 member organizations vote on their top policy priorities for the coming year. In the last two years, they have identified lead poisoning as one of their highest priorities. I think that’s because they see how much it has an impact, not just on children’s health, but really throughout many sectors of the city. Whether it’s education, housing, or even the criminal justice system,” said Magavern. The LEAD act recently was approved by the State Assembly and is pending in the Senate. There are two key components to the bill. One would ban children’s jewelry that contains lead. The other focuses on insurance. Ryan says liability coverage for renters would have to include coverage for injuries or damage for those exposed to lead. “Right now the taxpayers are paying for that when it should be the insurance companies. So we are going to endeavor to prevent insurance companies from writing policies that specifically exclude lead,” Ryan said. Lead screening results in the future could be included in the statewide immunization directory, pending further legislation. That would provide school districts and child service providers information on students who have been screened for lead. Lead poisoning can also impact adults, leading to hypertension and cardiovascular disease.